400mm is not long enough to compress the moon. If I were to use a longer lens, I need more clearance so I can back out far enough to make my kids small relative to the moon. Moon is very bright! There was some day light left when I took this picture. If you think about it, it’s actually lit by the sun. So the exposure should be f/16 @ 1/ISO. To solve the first problem (compression), I decided to rent a long lens at the last minute (200-400mm). With my 2X TC, that should give me 800mm max. The other problem is clearance. I need to find a location with clear line of sight; far enough from my kids so I can make them relatively small compared to the moon. Fortunately, I could back out a little more at the spot I shot last year. Not ideal, but should frame nicely. Finally, exposure. 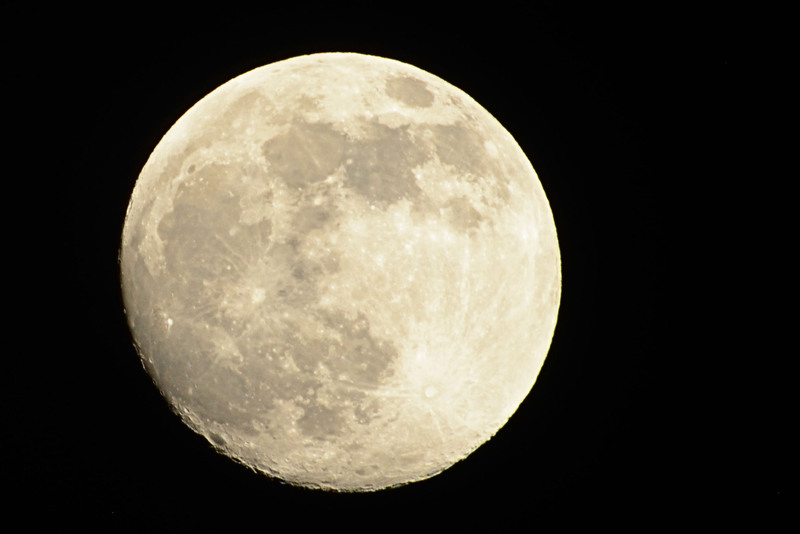 About 2 days before full-moon, I received the rental lens. So I gave it a test shot. This is a crop (about 1/4 of the frame). I was really happy about how sharp and clear I was able to capture the moon. But there was one problem… this was taken early in the evening right around sunset; the sky was actually light blue! This means there is no way I can get good exposure for the moon, the sky, and my kids. I need a back up plan. 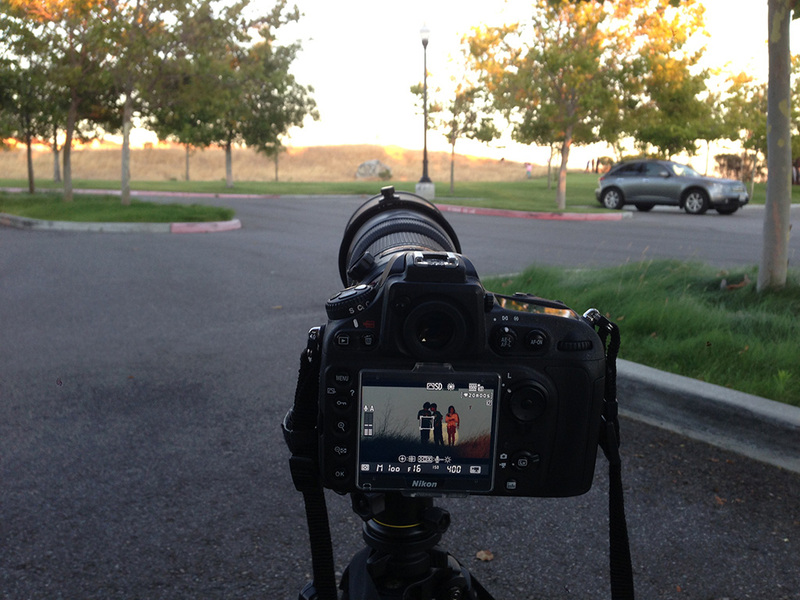 One option is to shoot on the day before full moon. You see, the moon will actually rise about an hour earlier the day before full moon. According to the almanac, moon rise will be 7:50PM while sunset will be 8:30PM. That means moon will be in the sky while the sun is still shinning over the horizon. I was not so sure how this will turn out; but heck, I have the rental lens. Why waste it? On the day before full moon, I cajoled my kids into coming up with me. I setup my tripod+camera. Then we waited, and waited… Finally, the moon came out! It didn’t rise over the spot I expected; I need to move quickly! I made some quick shoot angle adjustments; positioned my kids. And voila! Hard to believe it took me a whole year to setup this shot. Well worth the wait. The exposure of the pictures came out perfect even though the ambient was actually really bright. This is how it actually looked like when I took the shots. Notice how bright it was and how far my kids were? Can’t even see them in this iPhone snap shot. 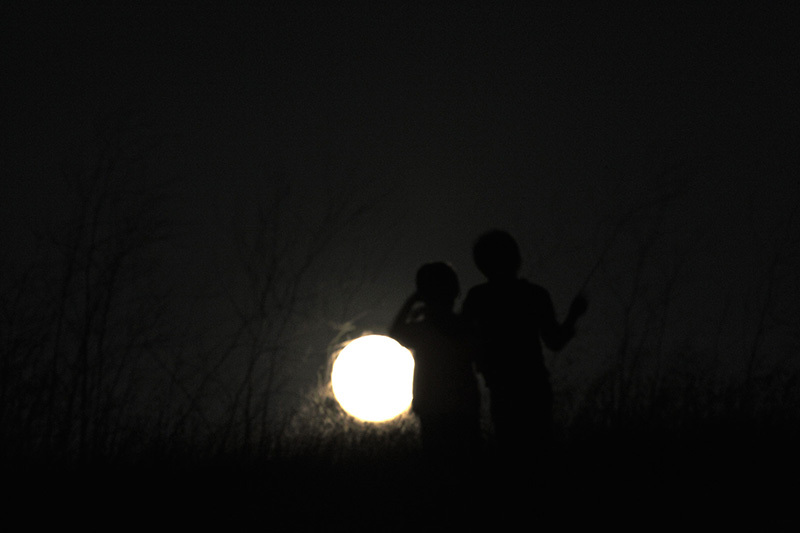 This entry was posted on June 28, 2013 at 3:29 am and is filed under Landscape, Personal with tags Chidren, Full, Moon, Photography, Super. You can follow any responses to this entry through the RSS 2.0 feed. You can leave a response, or trackback from your own site.